Ah camera straps ... they are like call girls: unless you have a big budget you'll have to settle for either a pretty but disfunctional one or a functional one with a moustache. I'm not in the market for adult entertainment but for some time, I have been looking for a new camera strap that is both functional and stylish without breaking the bank. I've looked online, I've looked on trade shows but couldn't find anything that I felt comfortable with until the people from Simplr reached out and asked me to test the M1a Mirrorless Camera Strap. Dear trolls, this is the time where you hit the comments and complain about me being dishonest, payed endorsements, etc. For the sensible people out there: I used to get a lot of e-mails from manufacturers asking me to review a product. I get a lot less of those e-mails since brands noticed that I will always tell my readers exactly what I think about a product, good AND bad. This leaves only brands who actually believe in their products. and often these are the people that are open to feedback to improve their products even more. I'm only endorsing products that I like and use myself. Only time will tell if this strap is durable enough to deal with every day (ab)use but everything from the stitches to the individual components feels sturdy, yet surprisingly light. The combination of a wider strap with small straps on the D-rings makes the camera easy to maneuver. I don't like bulky straps, definitely not with these small cameras. The Simplr strap is very flexible, thin and light which makes it easy to put in a bag or even in a jacket pocket without taking up much space. It also wraps around the wrist very easily and is comfortable to wear. I admit that leather straps often look even better but because they are less flexible and thicker they take up too much space to my liking. There may be more elegant solutions than these quick release buckles but you can't beat them when it comes to practicality. I like straps that are quickly removable in case I'm working on a tripod or want to put the camera in a water housing. Simplr uses the Op/Tech Mini QD loops, which are very sturdy and yet don't get in the way. For the past years I've been using the Peak Design Leash on my X100-series cameras which is a great system but it lacks some style and the big buckles are rather noisy when they bang against the camera. I like a strap that is quickly adjustable in length and is long enough to carry a camera across the body. The M1a fits those requirements, although for this giant, I would have liked it to be just a bit longer. Some straps seem to be always twisted but this one seems to straighten itself out pretty much every time I pick it up. It's the small details that often make a big difference during a long day of shooting. So far, I love this strap. It has pretty much everything I personally want in a strap. Of course, your needs might be different. I've only used it for a few days which says little about it's durability. 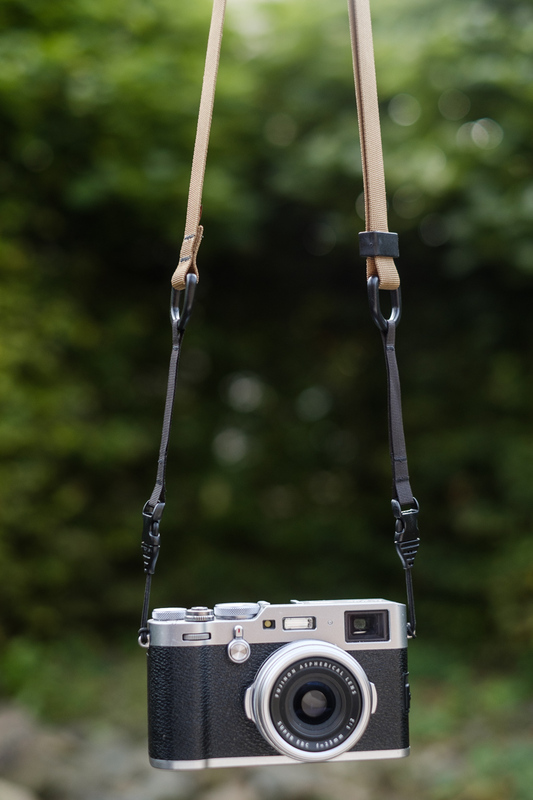 But it won't hold me back from ordering another two or three of these straps for my other X-cameras.